VIA will be debuting a 1GHz version of their low temperature, low power C3 processor at Computex Taipei (June 3rd-7th). Also on show will be the fruits of VIA's purchase in 2000 of ICEnsemble: a pro audio controller - the Envy 24HT, which gives 24-bit resolution, 96kHz sampling rates, and up to 12 input and output channels. 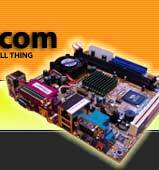 VIA have also recently announced a new Firewire chipset and we may even see new Mini-ITX products. Computex Swings to the VIA Audio Beat!